Wizards of the Coast's Community Manager for the Judge Network Sara Mox introduces the new Judge Center. Introducing the new Judge Community Manager, Sara Mox! 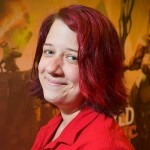 I’m delighted to announce that Sara Mox has accepted a full-time role at Wizards as the community manager for the Magic Judge network. She’s a fantastic fit for the role, with experience in judging, customer service, and politics.